Being a blogger means sharing experiences… but what to do when it comes to those experiences that you aren’t really familiar with? Well, you go for an adventure! 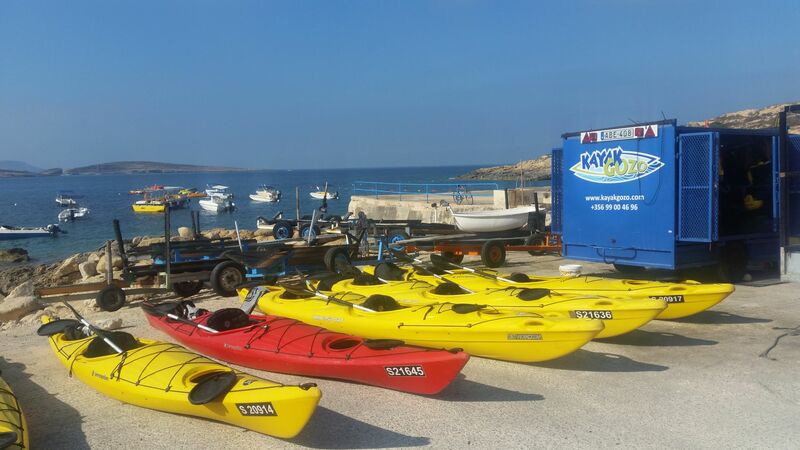 And so we did, Nick and I went for our first paddling experience with the guys of Kayak Gozo…Yuhuuu!!! You must know that Nick for me is aka “Tom Cat”, not only for his typical “cat attitude” to bossing me around all the time but also for his fear for the water… he likes it to drink and look at only. 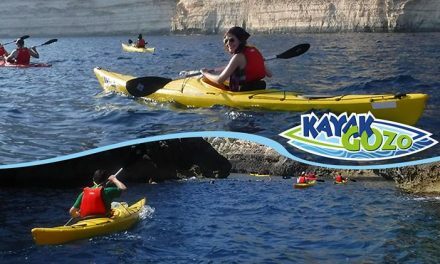 So considering that deep water is not really our element the Kayak experience was going to be a quite challenging for us! 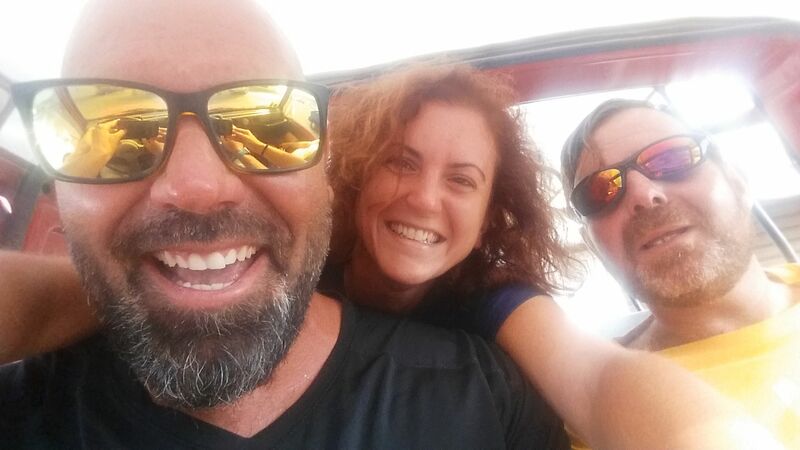 When Chris came to pick up us at the Mgarr Ferry terminal he just laughed and said: “you will be fine guys, I’ve just done a tough training with my team during a very rough sea with three meters waves, I will take care of you!”. 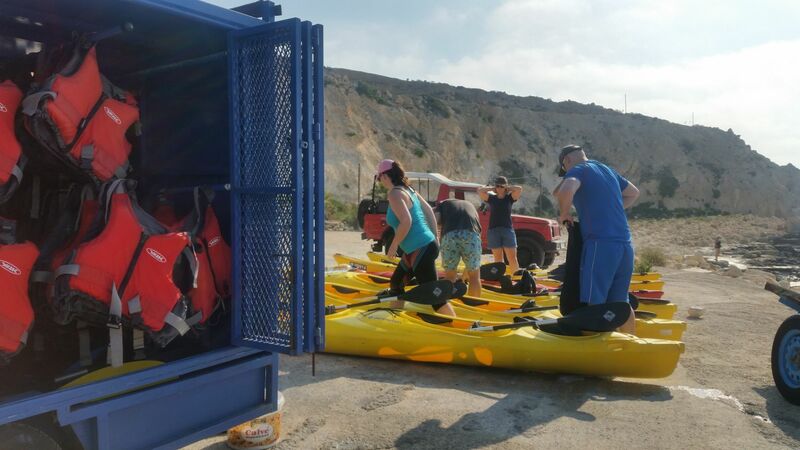 Reasurred by Chris statement and professionalism we were then familiarizing ourselves with the team, our adventure companions and the Kayak equipment. 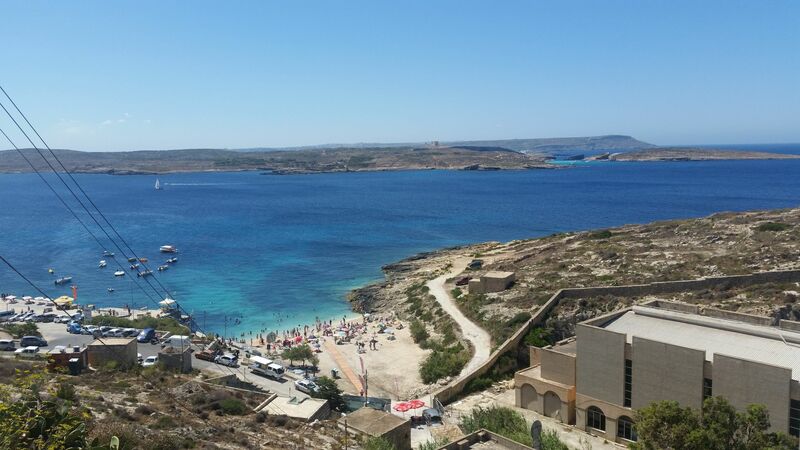 Our starting point was the beautiful Hondoq Bay just below the village of Qala on the Southern coast of Gozo. 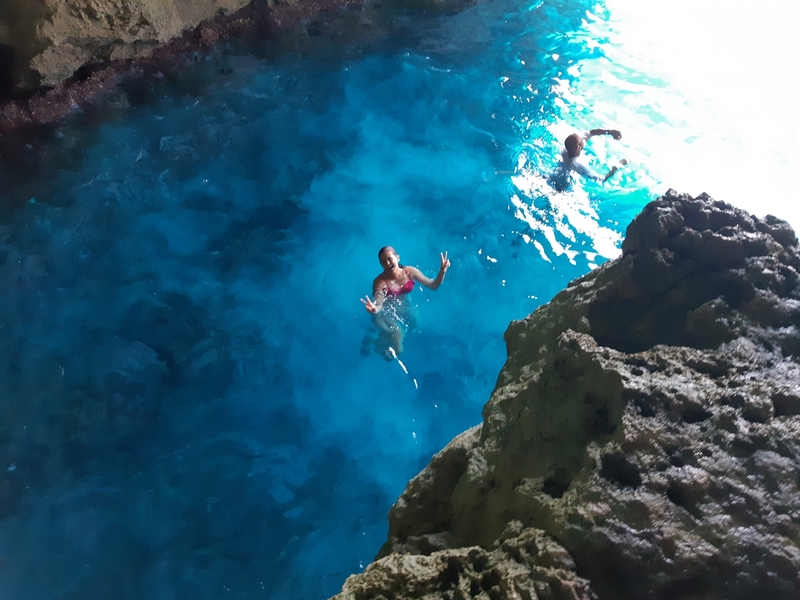 The lovely sandy and pebbly beach together with the beautiful crystal sea and the stunning view of the Blue Lagoon (on the right in the picture below) make this small bay one of the favourite by the locals, divers and snorkeling enthusiasts. 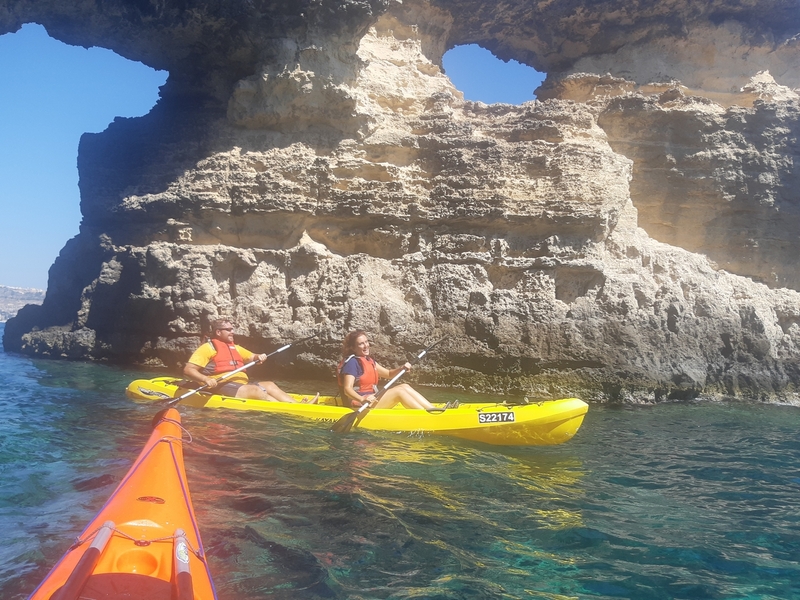 With Kayak Gozo you can book for a full day tour or a half day tour as we did and Chris and his team will group up people accordingly with their kayaking level of experience. 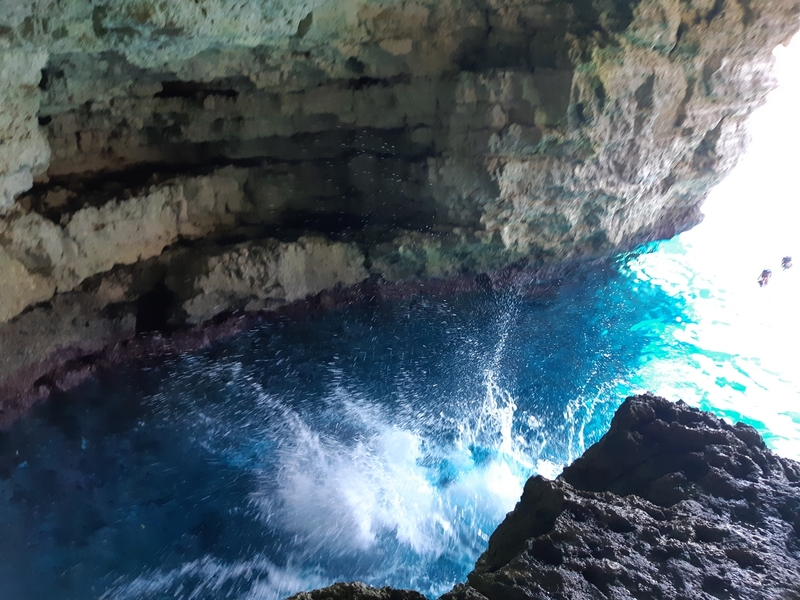 There is also the possibility to choose the type of exploration you want to do. 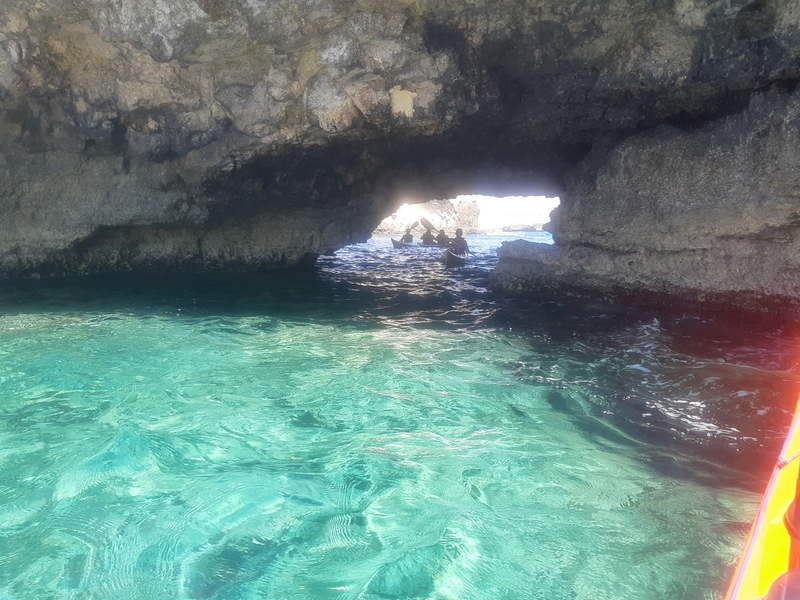 Infact, our group rather than paddling towards the Blue Lagoon decided to adventure for caves towards the northern tip of Comino to Santa Maria Bay, quiter than the Lagoon that at this time of the year is packed with tourists. 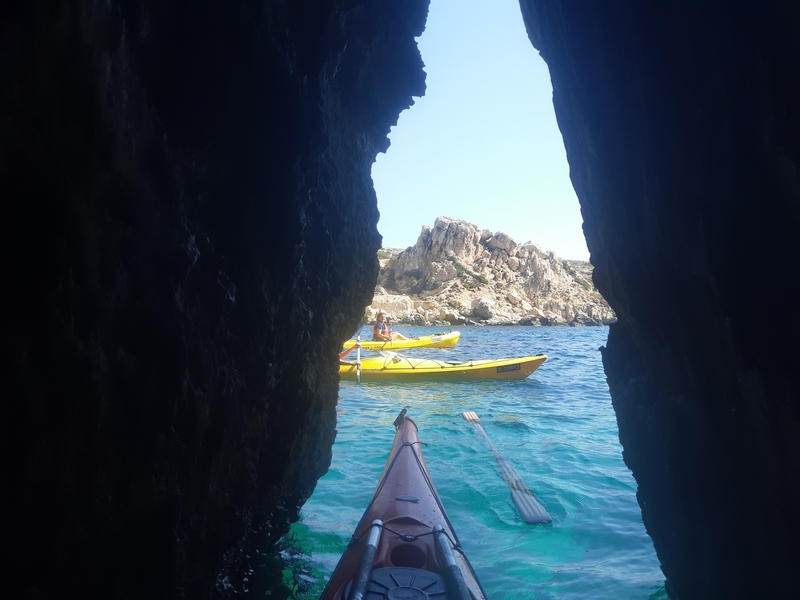 Personally, when I saw that Nick and I would have shared the kayak I thought: “right we are going to tip up straight away”. We are both not that great to listen to each other and Nick was only too pleased to remind me that as he was at the back, he was responsible to steering. 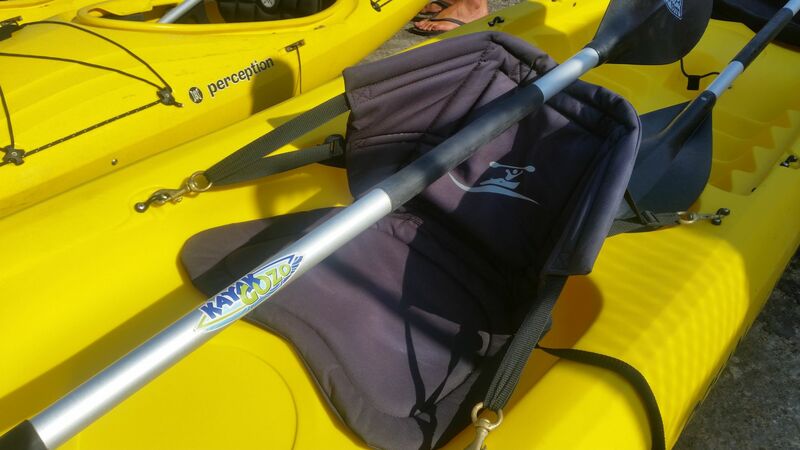 However, I must say that the kayak was very stable and sturdy enough to keep up with us! Confident that would have been just a matter of right and left, moving gently your torso, I didn’t expect that Nick would have turned into a proper pirate of the seas… Tom Cat was really paddling with all his heart allerting me of the (small) waves and boats on the horizon, whilst keeping me ‘motivated’ by shouting “paddle, paddle, paaadleee”… ohhh so funny! As we both had our water concerns and it was our first time, we started very slowly and at times shakily. 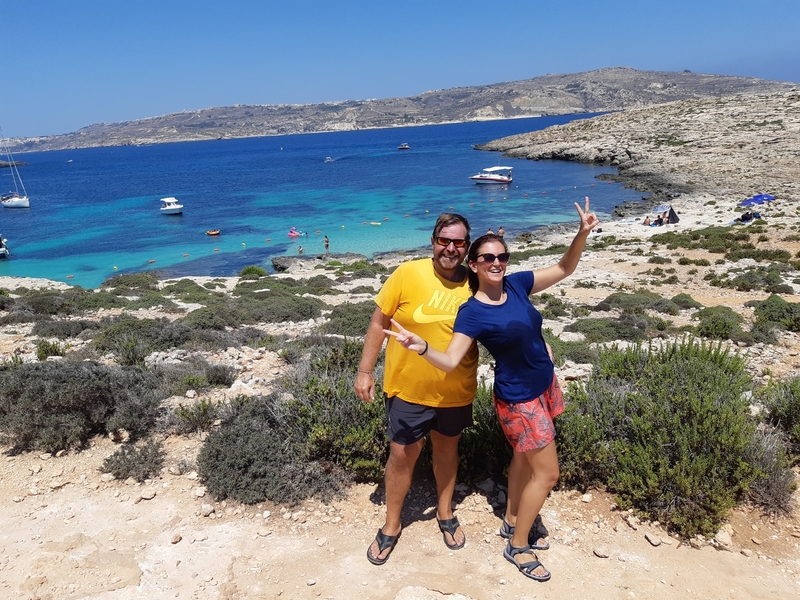 Despite being able to see the Gozo Ferry turn with ease into Mgarr, our turning skills were not quite so impressive to start! 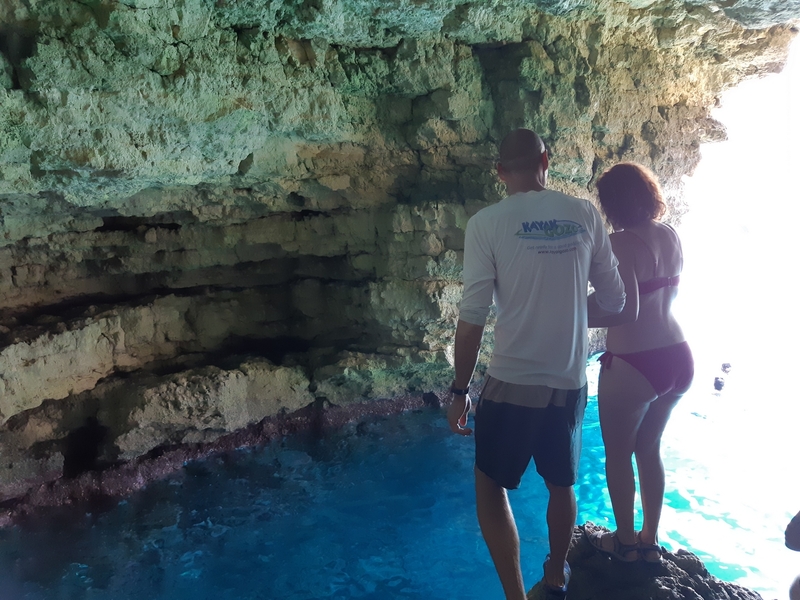 Luckily our companions Simon and Connie from Canada who where two pros compared with us, were very understanding of our limited abilities. 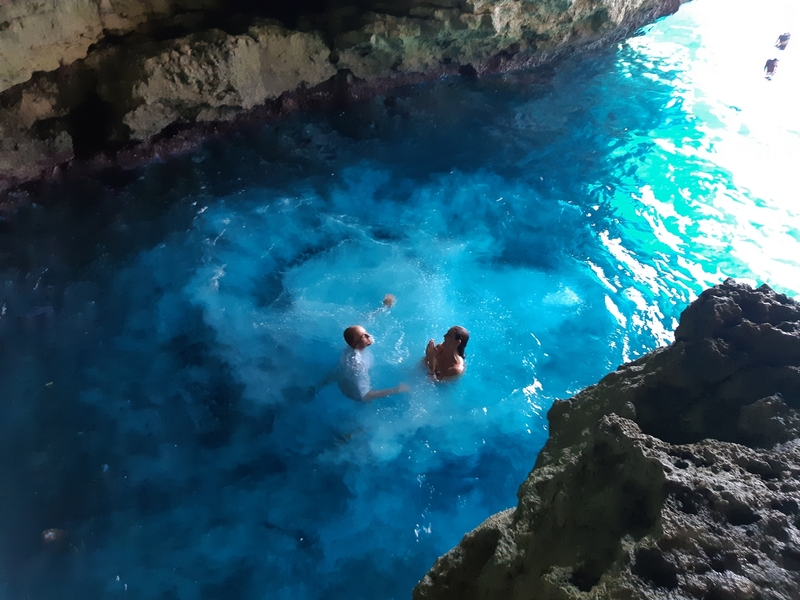 As they managed to graciously enter in small creeks and caves, we took the more direct approach often causing a bump but always greeted with a smile and reassuring words. We made it as well, in our own adventurous way but yet we made it! 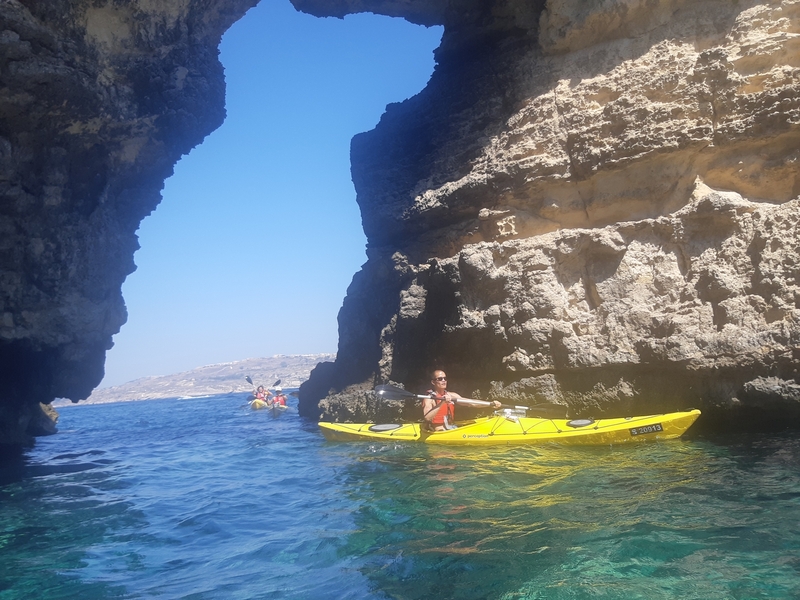 Chris and the team really care about you and as beginners he supervised us in every paddle, so much that we really felt safe with him to enjoy the experience! When we arrived at the stunning Santa Maria Bay, we got out of our kayaks and had a lovely slice of watermelon brought by Chris and a gorgeous granola bar made by Kristie, Chris’s beautiful partner and co-owner of Kayak Gozo (Chris likes to say that she is the organizational mastermind that keep them running). We went for a short trekking tour where I lived one of the most exciting moments for me. 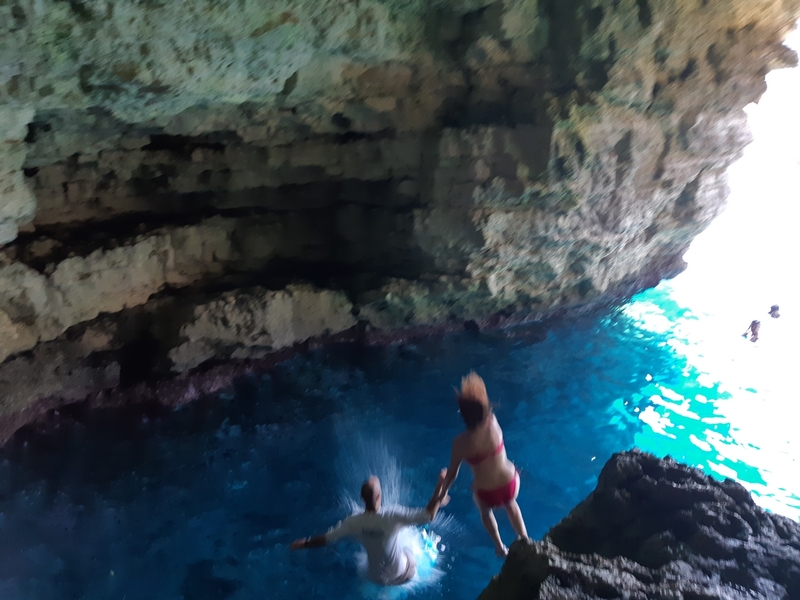 We arrived at the Smugglers Cave a super cool spot for divers and jumps lovers. Thank you guys… So Cool!!! 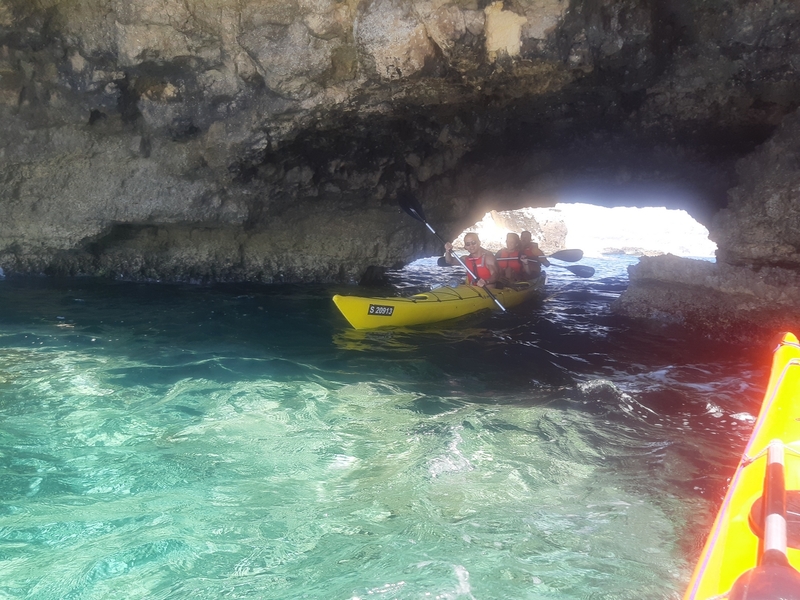 Heading back to Gozo we took the direct route, which Chris advised was 800m and should take around 12 minutes! 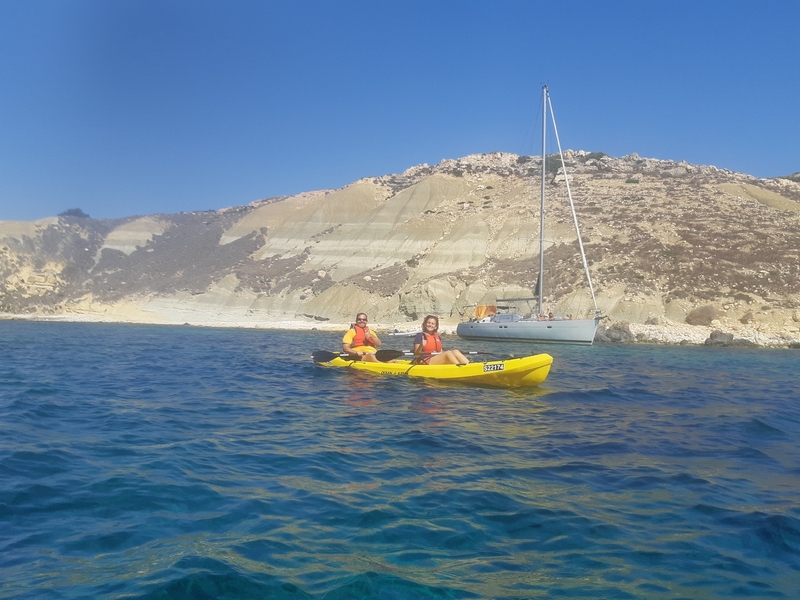 We were both far more comfortable with our kayaking abilities and managed to keep up with the more experienced group on the way back. At one point Nick’s competetive side even considered racing everyone back but instead opted to steer us into those waiting to get out of their kayaks! 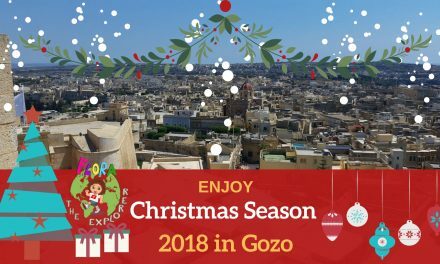 We really enjoyed it a lot! 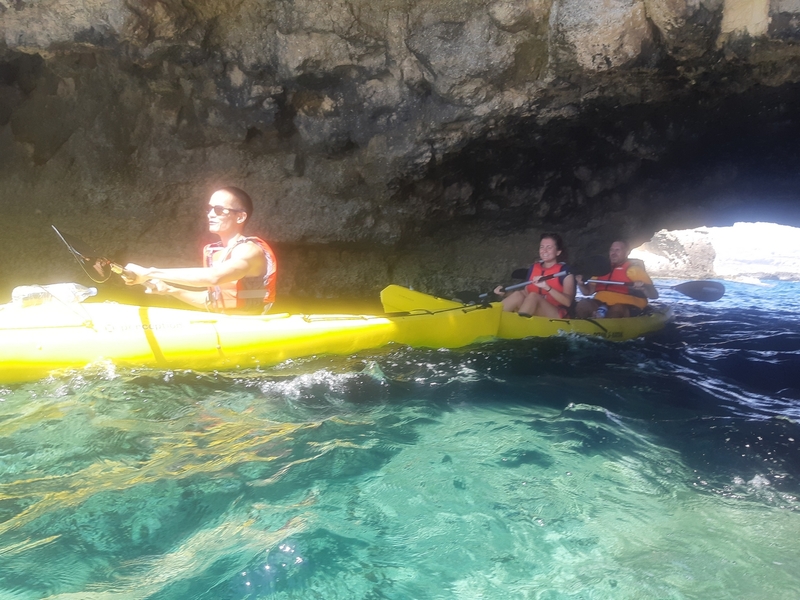 It was a super experience and if you are a complete beginner like us or if you may think that kayaking is scary, these guys will help you overcome any fear by supporting you all the way. It really was super! 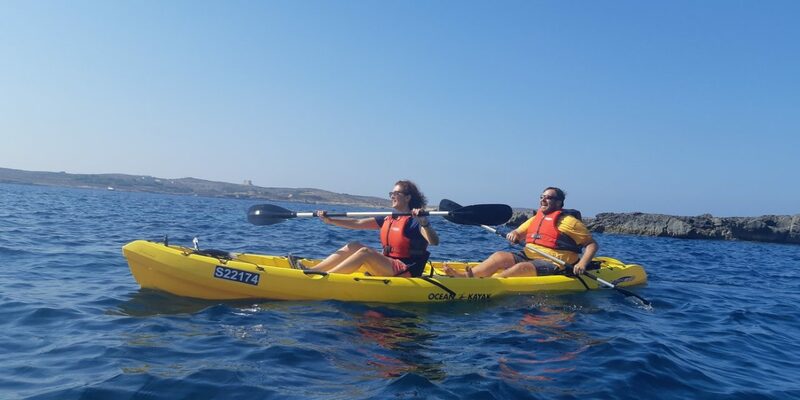 Expecially when you have as a guide Chris and the Kayak Gozo Team, they let you live the adventure with all the care possible! 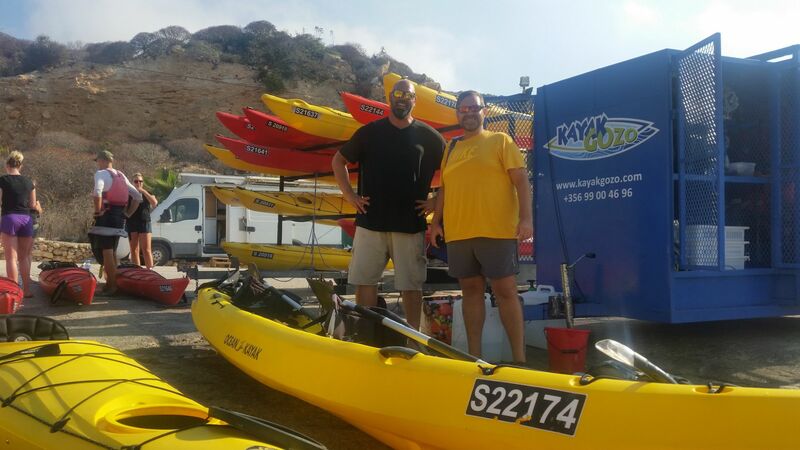 A huge thanks to all the Kayak Gozo guys, you are amazing!! !